When there are no remaining teeth in the jaw then there are three treatment options with which we can rehabilitate the jaw with implant supported restorations. 1. Full arch implant supported fixed prosthesis. To fabricate implant supported fixed restorations 8-10 implants are required in the upper jaw and 6-8 implants are require in the lower jaw. 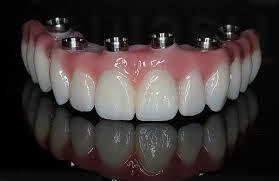 If the bone support is adequate then provisional crowns can be fixed over the implants the next day. A definitive prosthesis is then given after 3-4 months. 2. Implant supported removable prosthesis. 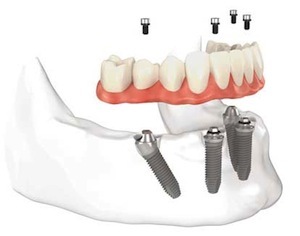 To fabricate an implant supported removable overdenture 2-4 implants are placed and either a bar or ball attachments are used to retain the denture over the implants. The Screw Retained Denture has proven to be an effective replacement for removable prosthesis. Patient receives a brand new smile in just one day. Final restoration is fixed and does not come out. The angled back dental implants avoid anatomical structures. 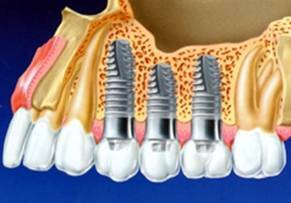 The dental implants have more surface area contact with bone resulting in a more secure bone integration. Angled back dental implants help eliminate the requirement of bone grafts. 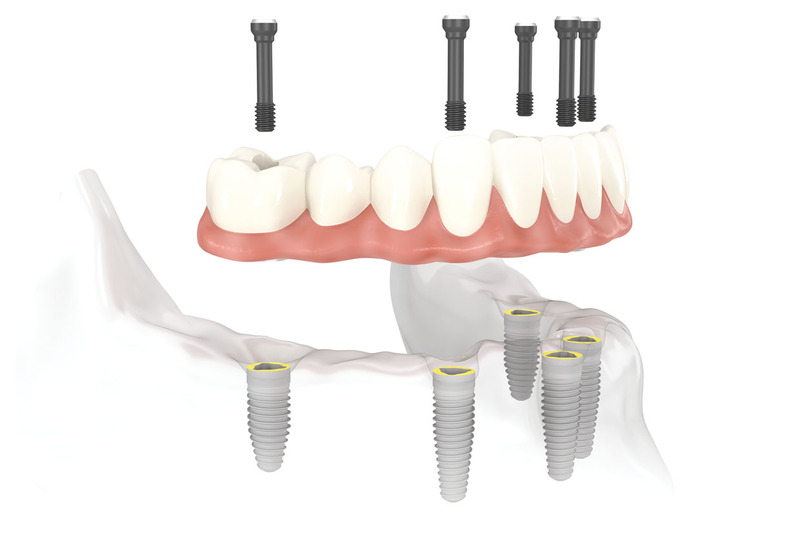 Front dental implants are placed in better quality bone and offer improved support by decreasing cantilevers. Entire procedure can be done in a day, even with full mouth extractions. Patient leaves with a full set of teeth. Teeth do not rest on the gum, thus no sore spots, easy maintenance and easy to keep clean. Eliminates frustration of bulky removable dentures. Restores a youthful appearance and fills out facial contours.